It’s absolutely undeniable that Capcom’s Devil May Cry is a masterpiece franchise. Without the original trilogy many modern action games wouldn’t have seen the dawn of day and this is completely thanks to the phenomenal combat system implemented in Dante’s demon slaying adventures. The HD collection packages all three original games without any additional content, but this isn’t a problem whatsoever. This HD package serves as a nostalgic reminder for classic fans of the series while introducing and showing new gamers what a true action game should play like. You would have to go all the way back to 2001 for the release date of the original Devil May Cry – eleven years later and despite a few dated camera issues, Devil May Cry is as stylish, challenging and fun as ever. For those of you not familiar with the franchise, you play as Dante, the son of Sparda, a demonic powerhouse. Consequentially Dante receives demon powers passed down through his heritage and an ego to match. Dante is an instantly lovable protagonist and has become an iconic video game character featuring in more modern titles like Viewtiful Joe 2 and Marvel vs. Capcom 3. Devil May Cry 1 chronicles Dante’s battle against the forces of evil. The intense and complex combat mechanics were unlike anything ever seen back in 2001 and to this day, they still hold up seamlessly. The whole premise is to rack up stylish combos by varying up your combos and employing all of Dante’s moves, tricks and abilities. Your combos are scored through a grade system with the coveted S rank at the top of the list – this then translates to an overall level score that offers plenty of replay value to those perfectionist gamers. Playing through the original is an epic trip down memory lane and sets you up nicely for the controversial sequel. After the roaring success of Devil May Cry 1, there was no doubt that a sequel was under way. In 2003 the second instalment of Dante’s adventure hit store shelves but it didn’t quite receive the same level of praise like the original. Devil May Cry 2 introduced some nifty additions to an already incredible combat system by letting players perform combos in mid-air and actively evade enemy attacks with a new evasion button. However, a lowered difficulty curve, a strange change of tone from Dante and a few other problems caused GameSpot to nominate Devil May Cry 2 as the most disappointing game of 2003. That’s not to say it really is a terrible game and indeed it’s fantastic to see how the series progresses and sets up what is arguably the best game in the series, Devil May Cry 3. Clearly learning from their mistakes, Capcom made up for their woes in 2005 with the release of Devil May Cry 3. The HD collection certainly saves the best till last as Dante’s egotistical nature is reinvigorated and elevated with some brilliant technical and storyboard decisions from the development team. Devil May Cry 3 introduced players to a new gameplay style mechanic, which allows players to concentrate on offense, defense, distance weapons or speed. Choosing your own particular play style was an important part of Devil May Cry 3 and really offers replay value for those looking to explore all the different styles. The infamous camera also become un-rooted and players had some control. Devil May Cry 3 received critical acclaim as Capcom brought another over-the-top tale and intertwined it with a barrage of tough enemies and a refined combat engine. The only thing that could be criticized was the difficulty level being just a little bit too high. So now you know what you’re going to get in the package but does the HD revamp enhance the experience in any way? To an extent yes, the HD overcoat does make the Devil May Cry games a whole load prettier, especially the original. However, not everything has been given the HD treatment, so at times you’re treated to some seriously nostalgic visuals, which isn’t a bad thing but if you wanted the retro look, you’d go back to your PlayStation 2. Oh and don’t expect any of the cut-scenes to be in HD, this has all been left alone too. Some of you may also be wondering if it’s worth playing these classic titles if you have completed Devil May Cry 4, the most up to date DMC experience. The answer to that question is absolutely play the originals because they are much better than number 4. In my opinion the fourth instalment introduced some frustrating elements to the series and the new lead character Nero was annoying and cheap, ruining any form of challenge the series previously offered. 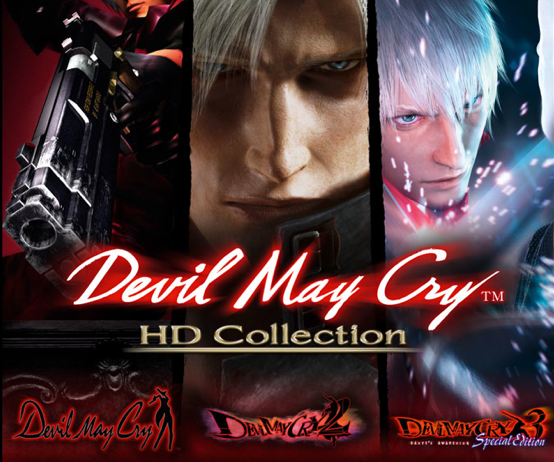 Ultimately Devil May Cry HD collection offers convenience for the modern gamer. It allows you to have all three fantastic titles in one case while enjoying the benefits of the HD make over. While issues such as the inconsistent camera and some graphical hitches are still present, they are more a mark of the age of the games as opposed to actual problems – gaming has simply evolved and this isn’t Devil May Cry’s fault. That aside, it is key for gamers to play and witness this highly influential trilogy and it is an absolute testament that so many years down the line, these games still feel fresh and fantastic, really suggesting how far ahead of the time they really were. Devil May Cry has always boasted pinnacle gameplay and Dante’s smooth moves are still as stylish and a whole load of fun to pull off. With each game you pass you can see the series’ natural progression as more enhancements are made to gameplay, design and presentation. This is action adventure at its absolute finest and if you haven’t played these iconic titles before, I highly urge you to do so. Age is prevalent in this HD collection and the lack of real detail in the HD coat is rather disappointing. There are very obvious inconsistencies with what the re-mastering process has affected and what has not. That being said, Dante’s charm has certainly not faded and when the action heats up it is intense and fun to watch. Devil May Cry has always been about over-the-top antics and flashy moves and this ideology has not faded. The Devil May Cry series is the one for completionist gamers. The grade rank system allows players to fight for perfection and ensure their combos are without fault and their scores are flawless. Harder difficulty levels also serve to keep you engaged and the infamous Dante Must Die mode sits smugly in the menus for the very best and most technically gifted gamers out there. This series is an absolute master class in action and once you’ve experienced it, you’ll find it very hard to stop. Very little can be said to fault the Devil May Cry series. Capcom has simply given players another opportunity to experience this brilliant trilogy or introduce gamers to the daddy of action games. The HD revamp is actually quite disappointing but it can be so easily overlooked when a set of games are just that good. Across the board you will find thrilling combat, plenty of action, lots of replay value and a plethora of mechanics that have clearly affected and influenced the video game industry as we know it today. Make no mistake eleven years ago Devil May Cry blew gamers away and while it may not have the same kind of impact now, it still serves as a reminder for us to respect classic games like these.